Kids and Cultures was started by a family with an interest and desire to learn about other cultures, and to share what they learned with others. To facilitate personal connections that introduce children to world cultures, promoting awareness, understanding, and responsible action. 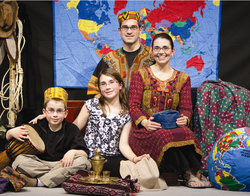 2003: Timm and Kristina Wenger incorporated Kids and Cultures as a non-profit organization. First storytelling show, Treasures of the World, written and performed. 2004: First week of Kids and Cultures Camp held, in partnership with Millersville International House. Applied for and received 501(c)(3) status. 2005: Four new shows created: A World of Sillies, Who Outsmarted the Czar?, Looking South, and Celebrate! World Holidays for Kids. Monthly Mini-trips for families started at the Lititz Public Library. 2006: Why Why Why in the World? show developed, and performed in libraries with the title AnimalWhys. 2007: Traveled to Turkey to film Really Big Field Trip. New show, CLUESapalooza, developed for libraries. One week of Family Camp held. 2008: Really Big Field Trip DVD released. Anansi Catches the Storytelling Bug performed in libraries. First Embassy Row Tour bus trip to Washington, DC. Developed Country Spotlight podcast. 2009: First Taste the World walking and sampling tours held. Performed A World of Fun in libraries. 2010: Taste the World coupon book released to complement two Taste the World walking and sampling tours. 2011: Organization converted to a for-profit corporation. Focus shifts to increase partnerships. Launch of World Tour program. After-School Snack Around the World program tested. 2012: Big Dreams Big Deeds show launched. 2013: 10th Kids and Cultures Camp held. Taste the World walking and sampling tours return, with a series of seven themed events. 2014 to present: We continued to offer storytelling shows and Taste the World walking and sampling tours. If you share our desire, interest, and vision, please contact us and let us know what you and your family are doing to learn about other cultures!